The new SBB Aqua Plus boiling baths are robust, reliable and provide continuous 100°C operation. The range consists of four models to suit a range of applications and any budget. The Grant SBB Aqua 5 Plus is a compact unstirred boiling bath providing continuous 100°C operation and capacity for immersing a number of small vessels. The Grant SBB Aqua 12 Plus is a small to mid-sized unstirred boiling bath with with continuous 100°C operation and the capacity to accommodate a variety of small vessels or a small number of larger vessels. 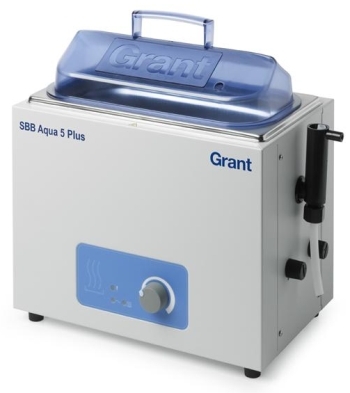 The Grant SBB Aqua 18 Plus is a mid to large capacity (18 litre) unstirred boiling bath providing continuous 100°C operation for immersion of a number and variety of small and large vessels. The Grant SBB Aqua 26 Plus is large robust and reliable unstirred boiling bath providing continuous 100°C operation and capacity for immersing a number of small vessels.